In anticipation of Hitman’s third episode, I spent the past weekend doing pretty much nothing but playing Hitman. I beat the new Elusive Target with a much better score than last time. I hit mastery level 20 in both Paris and Sapienza, including two suit-only silent assassin runs. I finally hit my Hitman stride, just in time for Episode 3 to disappoint me. I was let down by Hitman’s newest level, set in Marrakesh, but I was more disappointed in my own disappointment. I’d been so excited for it that I didn’t know what to do once I couldn’t be excited anymore. In another game, I would have chalked Marrakesh up as not really being my tastes and moved on to the next level, but I can’t do that given Hitman’s episodic release structure. I’m sure I’ll max out Marrakesh anyway, but it will largely be something to do while I wait for a level I might like better. Episode 3, “A Gilded Cage,” sends 47 to the Moroccan city of Marrakesh in search of two targets. One is General Reza Zaydan, who is holed up in an old schoolhouse after allegedly helping spring the second target, banker Claus Strandberg, from imprisonment. Strandberg was on his way to a trial for investment fraud, and now he’s hidden away in the Swedish Consulate while massive protests rage outside. Agent 47 is called in to kill these guys before they can topple the Moroccan economy. Hitman’s previous two levels took place in glamorous settings that had you stealthily crashing parties and taking the rich and famous down a peg. In Marrakesh, the areas where your targets can be found are far from fancy, and they lack the variation and possibilities of the previous locales. The schoolhouse where Zaydan is hiding is more like a level out of Splinter Cell than Hitman, all grays and browns and crates to hide behind. It’s populated almost entirely by soldiers, who are stationed in more or less identical dirty rooms. It’s not a bad location, but I didn’t find it fun being a soldier assassinating another soldier. Killing someone in a warzone wasn’t nearly as thrilling as silently taking them out at an opera, a fashion show, or a suburban birthday party. Strandberg is more interesting, a friendly man in a suit and tie who’s more approachable than you’d expect a war criminal to be. While the Swedish Consulate is architecturally distinct from the rest of the level, it’s still just an office building, with a couple of secrets sprinkled amongst copy machines and meeting rooms. I didn’t find anything as compelling as discovering the story behind Caruso’s mother or the multiple ways to crash the IAGO auction. The bright colors and rich textures of Caruso’s mansion made it feel luxurious, the home of a rich jerk you just wanted to shoot in the face (or explode with a golf ball, or put in the wood chipper...). While there were a few cool ways to take out Strandberg in the Consulate, both the building and the target failed to draw me toward them out of anything but a sense of obligation. 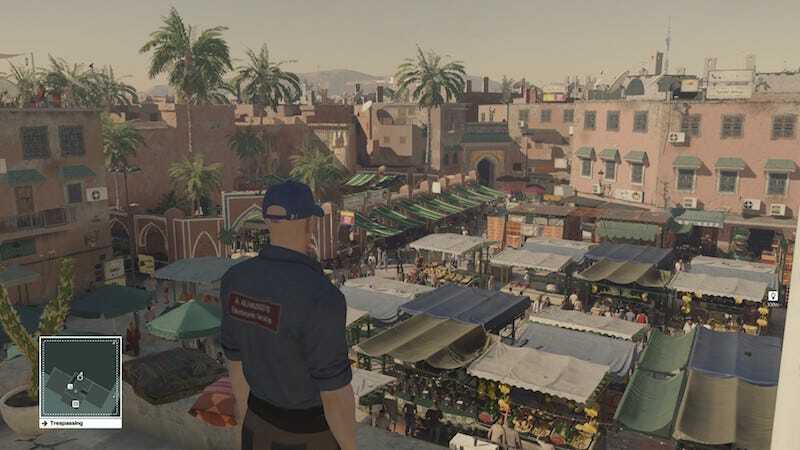 Marrakesh is no Sapienza, the great location in the game’s second episode. The crowds are impressive, and the streets are crammed with buildings to sneak into, but they seldom revealed secrets or disguises that opened up radically new possibilities. I wandered around the city looking for secrets or at least unexpected sniping spots, but nothing felt alive. Even the exits I found were mundane, simple gates instead of the badass exit points of previous levels. The characters discussing their lives or their political situation felt stilted, the riots little more than a milling crowd. There wasn’t much variety of character either, though the game hints at some outfits I’ve yet to determine how to get. The most interesting person in the level—including the targets—was this guy building IKEA furniture. The core of my Hitman experience is the glitz and glamor of the locations. It’s morphing from a generic bald everyman into anyone I want to be and then sticking it to the powerful before they even realize I’m crashing their gates. In Sapienza, I took perverse pleasure in watching Silvio Caruso eat the spaghetti I’d poisoned while I stood nearby disguised as the kitchen staff he’d just berated. In my suit-only run of Paris I blended in with a drink in hand as Dalia Margolis’ bodyguard wandered past me futilely searching for her, having no idea we were feet from her body in a nearby cupboard. Hitman’s targets have their power and their connections; 47 has his Silverballer guns and his skills. Targets seem to believe they’re above life and death, and I want to assassinate them largely just to prove them wrong. These righteous assassinations lose their meaning when they happen to people who expect to be killed. Marrakesh isn’t a bad level. It just isn’t what I want out of Hitman. Previously I haven’t been that bothered by Hitman’s episodic release. It doesn’t help the game, but it hasn’t hurt it much until now. I finished Marrakesh thinking “Maybe I’ll go play some Blood Money,” which can’t be what the developers were going for. I’m sure contracts, new Elusive Targets, and escalations will help me connect with Marrakesh; in this way, the game’s release structure might change my mind. But as I played through Marrakesh, I found myself wanting more Hitman, even with a new level right in front of me.